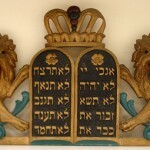 This week’s reading includes the Ten Commandments, first proclaimed in Parashat Yitro (though in this week’s version there are some changes). Some people say they can be religious without the Ten Commandments. Such people, it has been said, use the top of their heads and the bottom of their hearts. Actually a really good person combines their head and heart, knowing that the thoughts of their head need to be allied with the feelings of their heart. There are two stages, as the Shema (another leading passage in the sidra) tells us: the duty of the head, which works out philosophically that there is a God, and the duty of the heart, which uses the emotions for the love of God. In my mind I know there is a God; in my heart I love Him and seek to do Him honour. WordPress generated this page with 31 queries, in 0.231 seconds.